At Working Service Dog we are often confronted with people's concerns about traveling with smaller service dogs, particularly dogs that provide services to those with "invisible" disabilities. This blog will answer some of the more often asked questions along with sharing tips and experiences from some of our valued customers. Q. 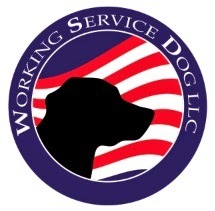 Do I need to register and or certify my service dog? A. First and foremost, never give money to a company that is going to "register your service dog" or "certify your service dog". This is a big scam found on the Internet, these no good companies are charging hundreds of dollars for a worthless certificate, registration number or ID Badge. Q. Can I train my own service dog? A. 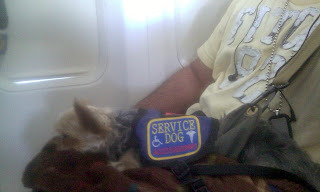 Yes, under the Americans with Disabilities Act (ADA) you may train your own service animal. Q. Does my dog need to wear a service dog vest or do I need to carry a service dog ID badge? A. There is no required gear for service dogs. Although in our opinion based on customer experiences for handlers with smaller service dogs or "invisible disabilities" it is a good idea. When your service dog is wearing his vest it is immediately evident that he is a working assistance dog and is afforded the rights as such. When most people think of a service dog the first thing that comes to mind is a guide dog or mobility dog. These dogs are typically larger service dogs. People do not think of smaller working dogs that provide services such as seizure alert dogs, hearing dogs, medical alert dogs and diabetic alert dogs to name a few. Because of this, these dogs will be challenged more frequently and wearing a service dog vest can cut down on the conflict. We hope this helps, please email us if you have any questions, concerns or experiences you would like to share. I recently traveled with my small service dog (9 pounds) who was wearing her vest so it was obvious she was a service dog. While waiting to board our flight I unzipped the top of her travel bag so she could stick her head out for some fresh air. I was SO surprised when a woman with a 10 month old baby literally stuck her baby's face right up to my dog's face and said, "Oh, look at the puppy...." I said to her, "Please don't..." and she said, "oh, I just figured it was a nice dog since it's so little"... I explained to her that she IS a nice dog but, as a working service dog, I'd rather she not have people right up in her face. The woman seemed annoyed. I'm so surprised that someone would do that with their baby!